Viewing topic "Will Motifator offer support for the Montage/MODX ?" I just purchased an MODX7 and was wondering if this community will offer support/comments for it? Sorry if this has been asked before. Many people has been asking, in this thread and others, why there is no Montage forum here on Motifator.com. Motifator.com was started in 2001, before Motif was even released. Over the ensuing 15 years it became an extremely powerful platform and forum (literally and figuratively) for everyone connected with Motif - Yamaha and its distributors, dealers and, most importantly of all, you: Motif owners and users. 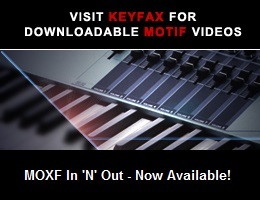 Keyfax, the company behind Motifator.com, was involved in the development of Motif, originally as UI consultants and subsequently as licensors of many of the signature arpeggios that remained in Motif and all related models for its entire lifespan. The flute flutters, the guitar fingerpicking patterns etc. You can even purchase more of these as Twiddly.Bits loop libraries here in the Motifator shop. But nothing lasts forever. Yamaha supported the notion of this site for as long as it deemed it appropriate to do so. Once it wasn’t, they didn’t. Motifator.com’s expertise and interest lies in Motif, not Montage. For Motif we have developed and made more than twenty full length videos, Pattern, Arpeggio and Voice libraries, physical accessories and more. Without wishing to cast any aspersions on Montage, Montage is no Motif, so we will leave it to others, should they wish and be capable, to emulate the depth and breadth of after-market support that we supplied for Motif. We do understand that some Motif owners will be interested in learning more about Montage. But so too are they interested in learning more about Arturia’s MatrixBrute, or EuroRack, or Roli’s Seaboard Rise… The world is happily chock-full of amazing developments in the world of synthesizers and keyboards. For us to seem to support Montage would be misleading and unhelpful because we don’t and we can’t. The only relationship we have with Montage is that it is the follow-up Yamaha high end synthesizer product to Motif. Accordingly, we have suggested that people use the Lounge to post questions, videos and whatnot and this does seem to be happening and long may that continue. Meanwhile, not only is Motif not dead it is not even cooling off. Motif will remain a massively powerful force for musicians live and in the studio for years if not decades to come. For us here at Keyfax, we feel our energies and expertise are best placed making sure Motif users have a safe and fruitful place to come visit, chat, argue, learn, and purchase their Motif accessories. Should Yamaha or any independently wealthy tech person like us to direct our expertise towards Montage we won’t say ‘never’ of course because for the right price we could all be tempted! But right now it’s best for us to stick to what we know. And what we know is Motif. Ok, I can understand that. I agree that the Montage is not the Motif - none the less, it is still a fantastic synth! Thank you very much for your response! I hope this forum remains open for a long time. There’s so much valuable information on here! Peace and good will to all of you!